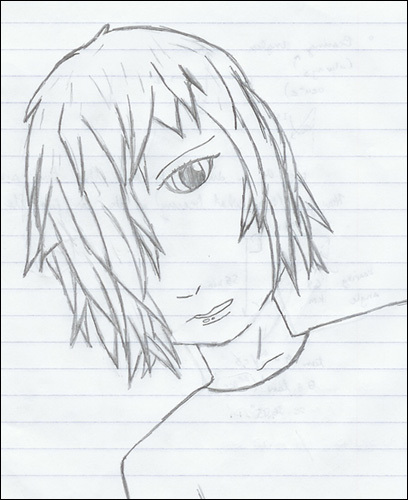 Comments: I'm pretty satisfied with this drawing -- I think I'm starting to get better with drawing hair...finally. 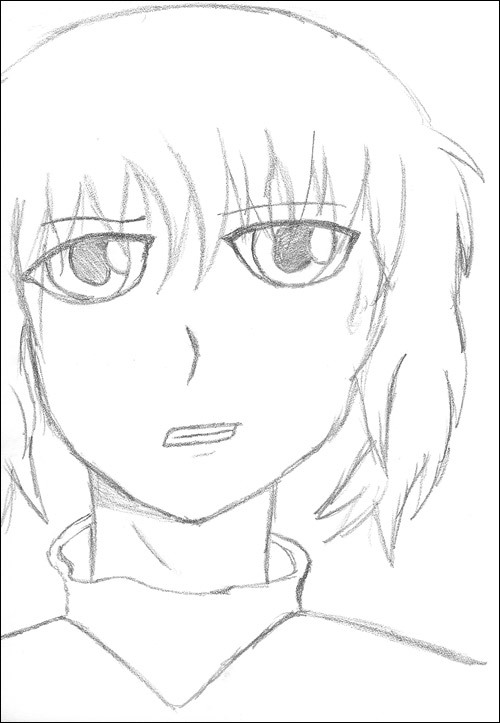 I noticed how my last drawing's eyes are similar to the way Kurama's eyes (from Yu Yu Hakusho) are drawn. So I decided to bounce this drawing's eyes off from Kurama's. As for why she looks scared...well, I was just trying out a new expression. Comments: I really LOVE this drawing. I think I did a surprisingly good job on this one. Compared to my last drawings, as you can see, I came up with a different "style" of an eye. 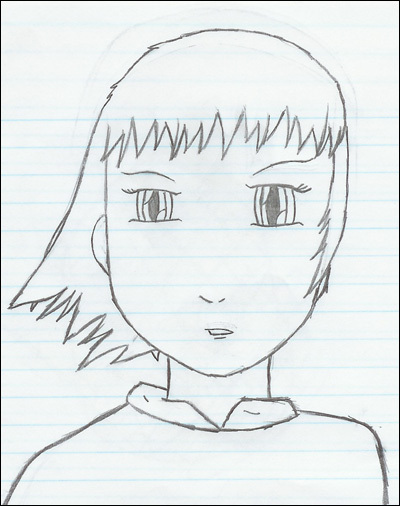 And I do like how it turned out very much; I think I might stick with that eye-style since I'm quite fond of it. I'm especially surprised at the nice job I did on the hair. I showed it to one of my friends and she liked it, so I'm happy someone else thought it looked nice. Funny enough...I was working on this drawing during my PreCalculus class (yes, I was bored). So if you can faintly make out some odd calculations on the drawing...then yep, those are some of my notes from the class. Comments: I really like how this one turned out -- I thought the hair was cute. 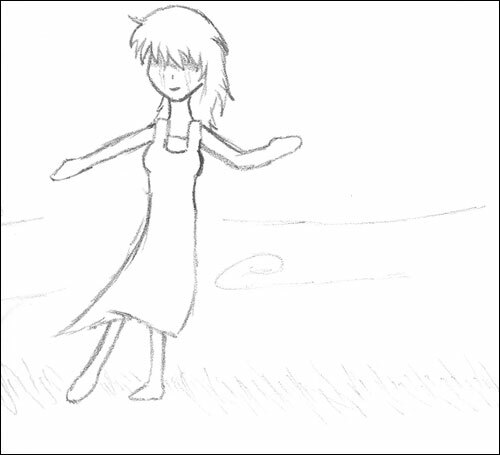 There's supposed to be an invisible "wind" blowing her hair, mind you. She's supposed to be raising her eyebrow at something, kind of like she's saying, "Huh?" in confusion or bewilderment. And yes, I know her "ear" is fake looking, so sorry. But my drawings of an ear aren't going to get any more realistic than that, for a long while. Comments: I was primarily testing and experimenting in this drawing. 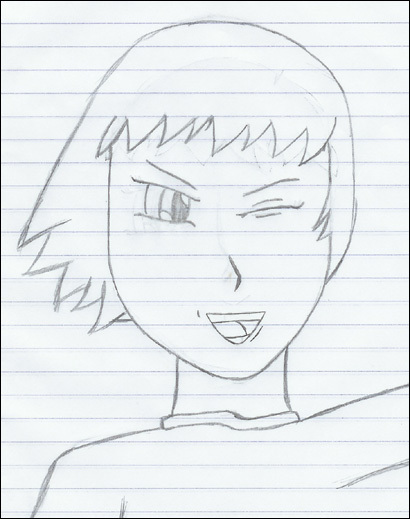 Notice the weird facial expression, not to mention I drew the nose "anime-style," again. And I wanted to see if I could do a decent job on smiles. And...it looks all right. As for why the person's got one eye closed, I was thinking of the situation where someone might be throwing something to you (water, or a pillow) unexpectedly, yet playfully, and in response, you're trying to shield your face from the blow. ...did that make sense?